In May of last year, I visited a friend in the southern part of Romania. The trip was amazing - I met many great friends and returned with fabulous shoes. However, I didn't accomplish my 2 major goals in going to Romania: 1) to visit Dracula's castle and 2) to see where gymanstics was born (Bela's gym). 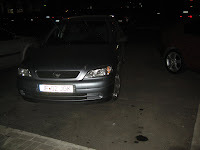 This last weekend, I returned to the northen part of Romania with goal #1 in sight. My friends O & M were excellent tour guides. 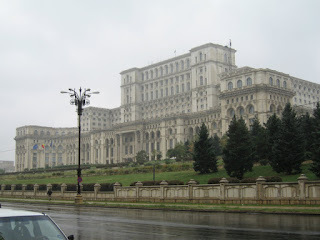 We saw sites within Bucharest & I learned many random facts. 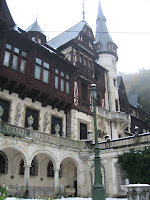 We saw the 1st snow of the season at the King's summer palace (Castle Peles)! I bought amazing boots. Hanging out with O & M was wonderful. And we visited Dracula's castle. All in all, the weekend was great. 1. The Parliament Building (pic above) is the 2nd largest building in the world after the Pentagon. It is built with only Romanian material. 2. In 1999, Donald Trump offered to purchase the Parliament building for $2B. He wanted to turn it into the world's largest casino. At the time it was valued at $4B, so the Romanian government turned him down even though the building is over 50% empty and costing taxpayers millions to maintain (it's only 95% finished). 3. Micheal Jackson was the only person to speak to a crowd while standing on the balcony in front of the Parliament house. He said "Good morning Budapest" instead of "Good morning Bucharest." Ironically, Madonna did the same at her concert 3 weeks ago. 5. Walking in Bucharest is like being in an obstacle course. Cars park in every spot possible, especially blocking the sidewalks. Stray dogs are everywhere. And there are huge puddles when it rains. Avoiding all 3 and keeping dry shoes in the rain is an adventure. 6. 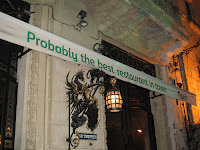 "Probably the best ever" - the slogan for Carlsberg beer - is branded on everything (see pic to the right). Who else hadn't heard of this slogan? 7. Romanian shoes are amazing, especially the high heels! Romanian women are impressive. They walk miles in their high heels. 8. The 1st King of Romania was German. The Romanians recruited him to be their king. He built his summer palace of all German material. His grandson is the now the King, but was exhiled when he was 16, during the Revolution. He grew up in France, and has now demanded his castles be returned to him. 9. Architecture in the Bucharest and mountain areas is very cute and distinct. There are lots of steeples on the houses and distintive wood-work (see pic to the left of Castle Peles). 10. When driving in the Transylvanian mountains, it is entirely possible to encounter: sheep, cows, horses, and dogs all crossing the road. They have the right-of-way and don't like moving. 11. Dracula's castle is over-rated and needs to be re-branded (more on that in another blog). Also, locals don't hang garlic outside their houses to keep vampires away. 12. Romania is composed of 3 parts: Transylvania (northwest), Maldiva (northeast), and the south. This is the 2nd time in history that the 3 parts have been combined into 1 country.